Here’s the yummy sauce for the gnudi recipe from the last post. This is a very easy and versatile sauce that could be used on vegetables, eggs, or Dreamfields pasta. Cook butter in small saucepan over medium heat until it is golden brown and has a nutty fragrance, about 4 or 5 minutes. Watch it carefully so it doesn’t burn. Remove pan from heat and add lemon juice. (It is very hot and it will foam, so be careful.) Stir in sage and pepper. 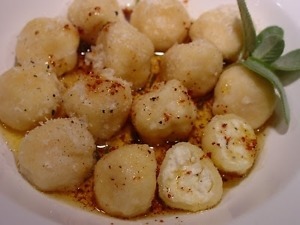 Pour over gnudi. Makes ¼ cup of sauce. Allow 1 to 2 tablespoons per serving. Browned Butter, eggs, or faux pasta, Topping for vegetables. Bookmark.